I was driving California Highway 12 through the Napa-Sonoma wine country in mid-December when a low, dark cloud drifted into my peripheral vision. It was over a vineyard and seemed to be billowing — a scary sight after the October wildfires that killed at least 43 people and burned more than 245,000 acres in Northern California. But as I turned to look at this cloud, it gained altitude, then exploded into a thousand winged pieces. They were starlings — a murmuration of starlings, if you go in for fancy animal plural words. The vineyard was fine. If you’ve been putting off travel to this wine country, think again. Among about 900 wineries in Napa and Sonoma counties, industry officials say fewer than 20 suffered significant damage in October, and most of those have been repaired and reopened. The story is similar for restaurants and lodgings. If you look for scars on the landscape, you will find them eventually. But I saw a lot of untroubled territory in a pair of trips in November and December tracing some of Napa and Sonoma counties’ most popular tourist routes. The area is so beautiful that it may startle anyone who saw the live coverage of those fires. You see acre upon acre of splendor, especially if you keep your eyes on the lowlands where most of the cities, towns, restaurants, lodgings and tasting rooms are. If you check the horizon, some ridges are darker than others. That’s scorched earth — barely distinguishable from shadow from miles away. Meanwhile green shoots are multiplying. Nearly every business is open in the town plazas, and you see “thank you, first responders” signs on facades and shop windows. Many businesses invite customers to contribute to a local charity. Napa and Sonoma are not, however, awash in “fire sale” price-cutting. Although some hoteliers say they have deepened their usual winter-season discounts, many hotel rooms and homes that might have been occupied by travelers are instead housing locals whose residences were damaged or destroyed. Surveys by lodging consultants STR show that from Dec. 1 through Dec. 30, the average daily rate at Napa County’s hotels was $233.15, down 3.2% from the previous year. But the occupancy rate was 56.5%, up from 54.3% the year before, said Clay Gregory, president and chief executive of Visit Napa Valley. About two-thirds of visitors to the area, however, are day-trippers and not overnight guests. Several entrepreneurs told me they hope their numbers will return to normal in the spring, but nobody is sure. If you’re a Californian — or even if you’re not — this might be a fine time to pop in, spend a few dollars and remind our northern neighbors that we’re in this together. Although the fires began northwest of Calistoga on Oct. 8, the flames never reached Napa Valley’s main tourist corridor, which includes downtown Napa, Yountville, Oakville, Rutherford and St. Helena. Nor did the fire reach Lincoln Avenue, Calistoga’s main drag. As you drive among those towns along on California 29 or ride the Napa Valley Wine Train (which parallels the highway between Napa and St. Helena), the valley seems open for business as usual, including the new Archer Hotel in downtown Napa. Scott Goldie, the wine train’s co-chief executive, told me later, “We were probably off by 80%” in early November.” But by early January, Goldie said, the shortfall was about 30%. Goldie, who lost his Atlas Peak home in the fires, has decided to bet on a big comeback. 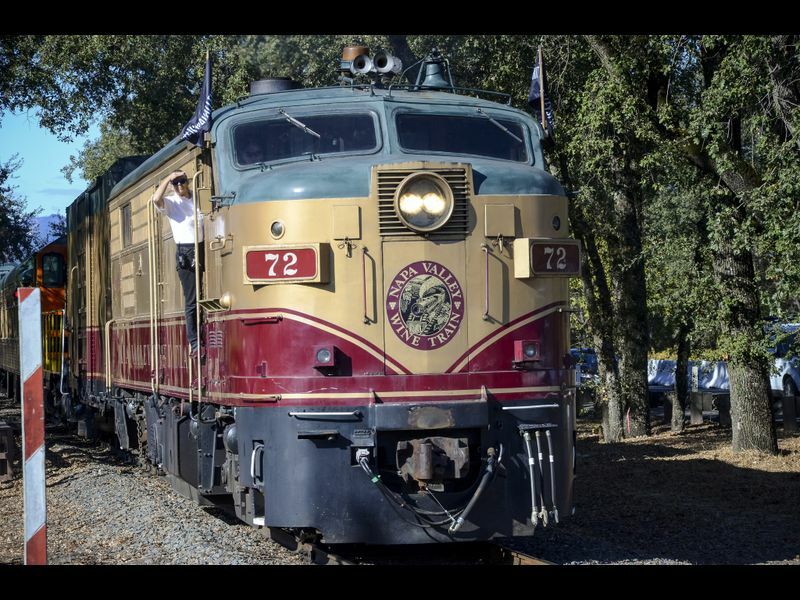 Beginning in April, he said, the train is adding cars and offering more excursions than it did last year. I also browsed Napa’s Oxbow Public Market, walked along the Napa River and spent a night at the Indian Springs resort in Calistoga. No visible trouble, but Indian Springs general manager Tim McGregor mentioned he had lost his Santa Rosa home in the fires. In all, Napa County officials said, the major fires here (Atlas, Nuns and Tubbs) killed seven people and burned 69,979 acres. Yet county officials estimate that just 110 acres of vineyards burned. In Napa County, 1,051 structures were destroyed, including 611 residential units. Just north of Calistoga, Robert Louis Stevenson State Park’s Mount St. Helena Trail is still closed, but its Table Rock Trail, Palisades Trail and Historic Oat Hill Mine Road are open. At two of the area’s popular winery tasting rooms — Rutherford’s Grgich Hills Estate and the Castello di Amorosa outside Calistoga — I found the settings flawless and customers happily sipping. Henriette Steinrueck, Castello’s vice president of operations, later told me that sales in early November were about half their usual level. By early January, she said the shortfall had shrunk to 15% to 20%. Among the more than 400 wineries in Napa County, Napa Valley Vintners spokeswoman Patsy McGaughy said, five sustained significant damage. Of those, McGaughy said, just one that was open to the public before the fires is still closed — Signorello Estate in the hills off the Silverado Trail. Its owner has vowed to rebuild.